We are about to go on vacation and I don't want to be in the kitchen but I still wanted home-made meals. 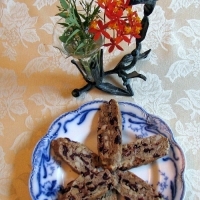 Saw the odds and ends of nuts left over from Christmas baking and thought that some nice biscotti would make for a quick breakfast and be a special treat as well. # Preheat your oven to 300 F (aka 150 C). Sift the flour into a measuring cup to get your proper measure. I find there is a real difference in sifted and unsifted quantities and I am a strong believe in sifting. # In a good sized bowl, mix together oil and sugar until it is well blended. Now mix in the vanilla extract and then beat in the eggs. # Combine spices, salt, flour, and baking powder. Slowly stir this into the egg mixture. Mix in the cranberries and nuts by hand. # Divide your dough in half See Photo. 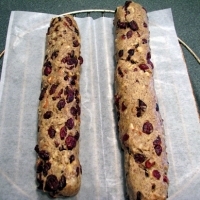 Create two logs (about 12x2 inches) on a parchment paper lined cookie sheet. The dough will be sticky, so wet your hands with cool water. I put a cup of water on the table to make it convenient. I also used sheets of wax paper to roll the thing out, discarding and transferring to fresh. I didn't want to over handle the dough. # Bake for about 35 minutes in the preheated oven. When read the logs will be a light brown. # Remove from oven, and set aside to cool for approximately 10 minutes. Reduce the oven heat to 275 F (135 C). # Cut the logs on diagonal into 3/4 inch thick slices See Photo. 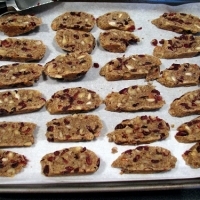 Lay on their sides on parchment covered cookie sheet and bake about 8 to 10 minutes.